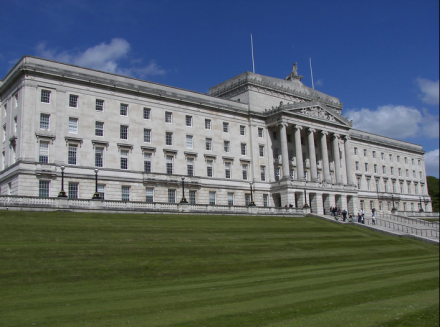 It has been some two decades since a Labour government in Westminster, in partnership with Dublin, the SDLP and an extraordinary breadth of nationalist and unionist politicians, clergy, trades union leaders and paramilitaries, brokered the Good Friday Agreement. Yet, this peace, which has so transformed the human economy of Northern Ireland, now faces its greatest crisis as, after two elections and abortive talks to form a power-sharing executive, negotiations at Stormont are now haltingly carried out under the pall of what the Ulster Unionist chief negotiator described as “simply the worst” logjam ever. The magnitude of the immediate task is poetically apparent at the little border townland of Rostrevor, County Down. For, as you stand on the soaring slopes of Slieve Martin above the village, and stare across the staggeringly beautiful sweep of sea and Arcadian loveliness below, just on the other side of Carlingford Lough now stands “Europe”, and even the lapping water sobs at the sadness of it. It was the grassroots labour movement, faith leaders and civil society that were the “little leaven” and quiet lobbyists for a vision of peace that was more than merely orange or green, recognising rather the common aspirations to equality of working women and men in Northern Ireland, and the “multiple belongings” of all its citizens as parents, co-workers and neighbours, regardless of creed or ethnicity. By contrast, the Tory adventure with Hard Brexit now callously reignites just these primitive divisions through economic uncertainty and attendant tribal scapegoating of minorities. In the face of the urgent calls by academics and civil society leaders for certainty that – post-European Union – the people and the economy of the North will not be cleaved from the rest of the island with a customs border and severance from access to the single market, the government has responded dogmatically with an astonishing lack of intellect and imagination, and even some air of colonial neglect toward that soggy province. Any more than the NHS, the future of the Good Friday Agreement is not safe in Tory hands, and it is critical now that the Labour Party leadership, in partnership with the labour movement in the North and South of Ireland, seizes the moral courage to stand for our people’s right to a borderless peace and tariff-free livelihood. At the recent St Patrick’s celebrations of the Labour Party Irish Society (LPIS), the SDLP’s Margaret Ritchie spoke of how, after bloody decades of The Troubles, surely the people of Northern Ireland have the right to have it both ways, concurrently Irish and British citizens, connected both to the EU single market and the departing UK, nurturing a nationhood of “reciprocal pluralism”, where Chinese, Polish and Muslim cultures add their colours alongside the orange and green. That this Paddy’s Day occasion was poignantly marked also by an LPIS award for mixed-race Irish activists speaks to the Labour values in which I was brought up from boyhood by immigrant parents, and which allow a Muslim clergyman without a drop of Celtic blood in him, to rejoice in the honour of playing Irish fiddle and singing sean-nós, as one of the lads. The egalitarianism and pluralism that the labour movement champions for all working people is exactly the “little leaven” that may serve to diffuse present unionist fears that nationalist aspirations for an Irish Language Act somehow represent a “weaponising” of a beautiful Gaelic patrimony into an alleged tool of ascendancy. Recent weeks in Rostrevor rather have seen a remarkable island-wide gathering of Protestant, Catholic, Jewish and Muslim faith leaders with orange and green politicians under a banner of pursuing not an enforced consensus, but rather seeking a “higher quality of disagreement”, and boldly celebrating expressions of different belief and culture. As a clergyman, I’m naturally going to say that the liminal spirit of divinity shines most truly in the borderlands of human vulnerability and transition, the gloaming point where the shifting colours of Carlingford Lough bathe both Northern and Southern shore and, to this day, paint the cloud with images of the two Protestant and Catholic childhood friends who died together in this place. The authentic values of our people have never bowed the knee to cyclical tabloid populism, but rather have stood against the tidal ebb and flow of prejudice and inequality, a very Irish countercultural morality of “cherishing all of the children of the nation equally”. I have had the privilege to witness how my sisters and brothers in the Irish Labour movement and the Irish diaspora in Britain have made sacrifices for justice in the name of the weakest and poorest of all communities. And yet, today, we watch in desperation as “project hard Brexit” steamrollers over a seemingly impotent Labour response, and appears to collude with a narrative of Northern Ireland’s forgottenness. I need Jeremy Corbyn and the Labour leadership to hear how my brethren have fought for Labour values, and how the party now needs to listen to us, talk with us and fight for us in championing the twofold policy commitment for the North to remain border-free within the EU customs union and with access to the single market. The Good Friday Agreement is the people’s right – and herein lies Labour’s ethical imperative to defend our corner. Sheikh Dr Muhammad Al-Hussaini is senior fellow in Islamic Studies at the Westminster Institute and universities officer of the Labour Party Irish Society.